Family, friends, festivities…and a BIG bump in sales. 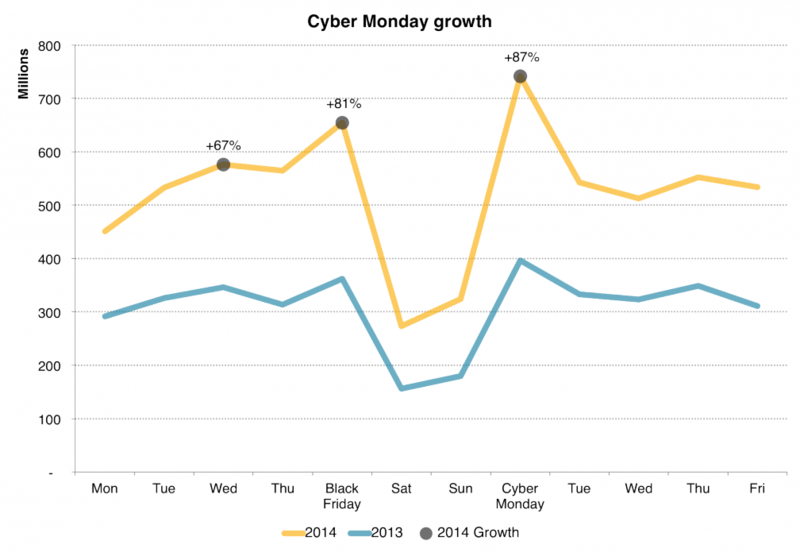 That’s what the holiday season means for millions of e-commerce stores all around the world. The holiday season is traditionally the biggest sales period of the year. Between Halloween and New Year, millions of customers spend billions buying gifts for friends and family. In fact, roughly 24% of all retail sales in the US happen during the holiday season. It doesn’t matter what you sell or which country you sell it in, the holiday season is crucial for your store’s profitability. If you’re still on the fence, check out our recent post on which holidays your business should take part in. The question now is: how can you make the most of the holidays? In this post, we’ll share 4 proven ideas to help you make the most of the lucrative holiday season. 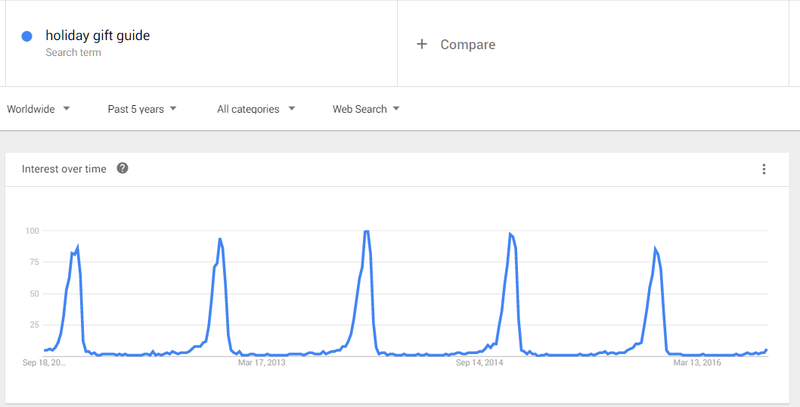 Pinterest is exploding right now. With over 100M active users, Pinterest is one of the top 5 social networks in the US. Pinterest users are in a shopping state of mind. 93% of users are using it to plan purchases. Pinterest users are more receptive to advertising (i.e. Promoted Pins), making it easy to scale up your marketing. One of the best ways to use Pinterest for holiday marketing is to run a holiday-themed Pinterest contest. Pinterest is a visual platform, which works perfectly to show off your products. The contest format encourages organic engagement, increasing your reach exponentially. Here’s how you can run a Pinterest contest of your own. Start by asking contest entrants to create a custom board where they can share their pins with you. 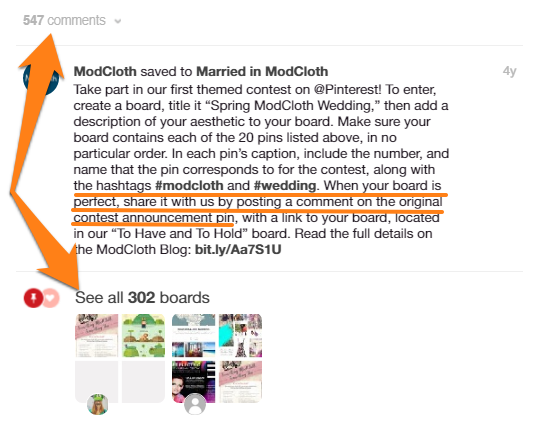 For example, for its Pinterest contest, ModCloth asked participants to create custom boards titled Spring ModCloth Wedding. Ask participants to follow you on Pinterest before entering. 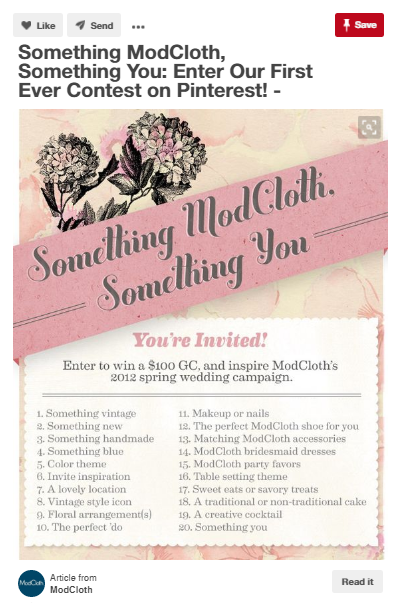 Use your brand name in the board title (like Spring ModCloth Wedding above). Offer a relevant prize to encourage participation. This can be a gift card, a holiday makeover or something related to the holiday season. Next, ask contest participants to pin pictures to the recently created board. You can have a free hand when choosing what type of images to share. Ideally, they must be somewhat related to your brand or contest theme. Most of these correspond to the contest theme — weddings. Don’t ask participants to pin any specific images — that’s against Pinterest’s terms of service. Use vague categories such as something vintage. This gives contest participants much more room to experiment and makes the entire process more fun. Ideally, pinned image categories should correspond loosely to your brand. If you don’t offer any vintage clothing, don’t ask followers to share a lot of vintage clothing pictures. The best way to do this, of course, is through Pinterest itself. You can either divert traffic to this organically or run a paid Pinterest campaign. Make sure that the contest pin image dimensions are large enough for Pinterest. Like the above example, make your images tall, not wide (i.e. portrait, not landscape mode). 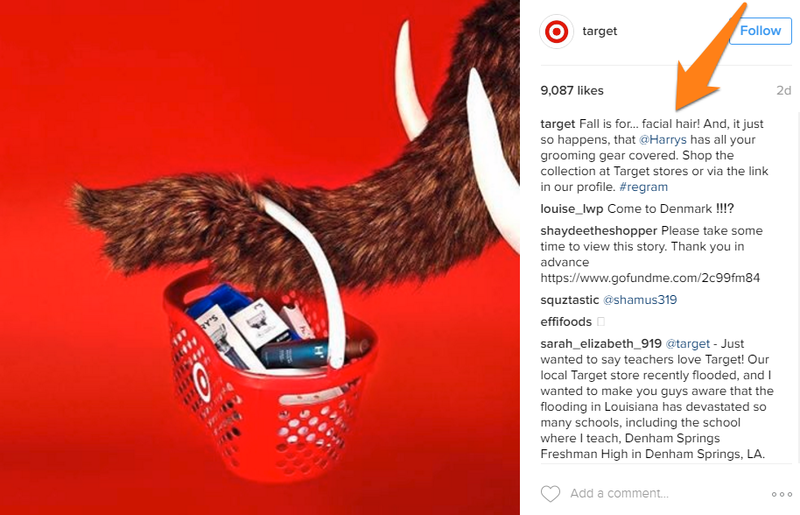 Ask pinners to use branded and generic hashtags when pinning. 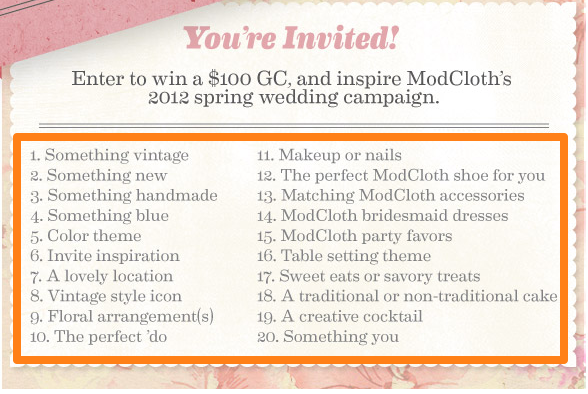 For example, ModCloth asked participants to use the #weddings and #modcloth hashtags. Ask participants to share their board links in Pinterest comments. This creates social proof and encourages participation. This is pretty much the playbook for running any kind of social contest. 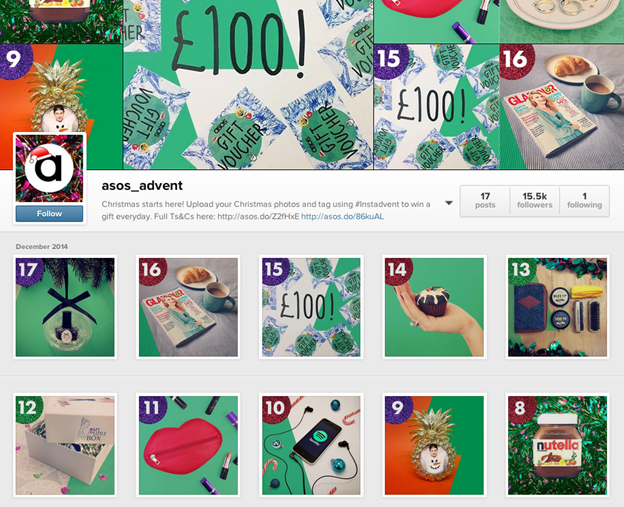 While it works great on Pinterest, you can also run similar contests on Instagram or Twitter. You can also use Wishpond’s Pinterest contest app to make this process faster. HUGE popularity among millennials — 90% of its users are under 35. You can use branded hashtags to curate contributions from followers like in the Pinterest contest example above. 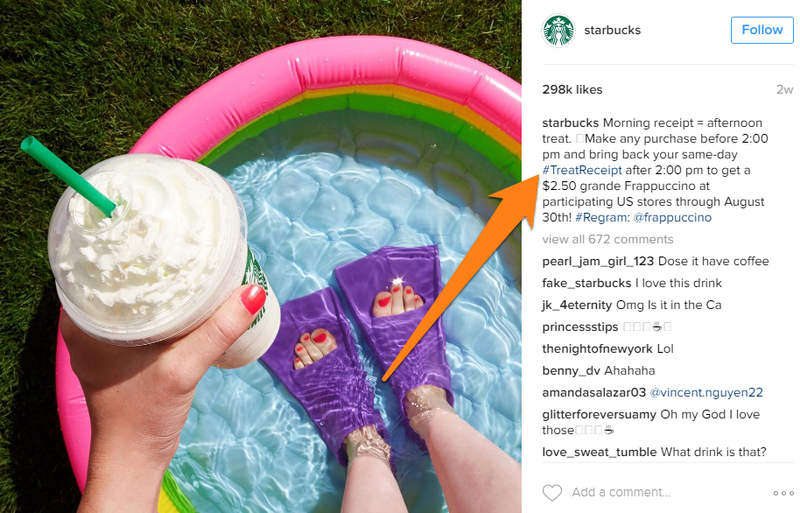 For example, Starbucks runs mini-contests every week where it encourages users to share their pictures with the #TreatReceipt hashtag. 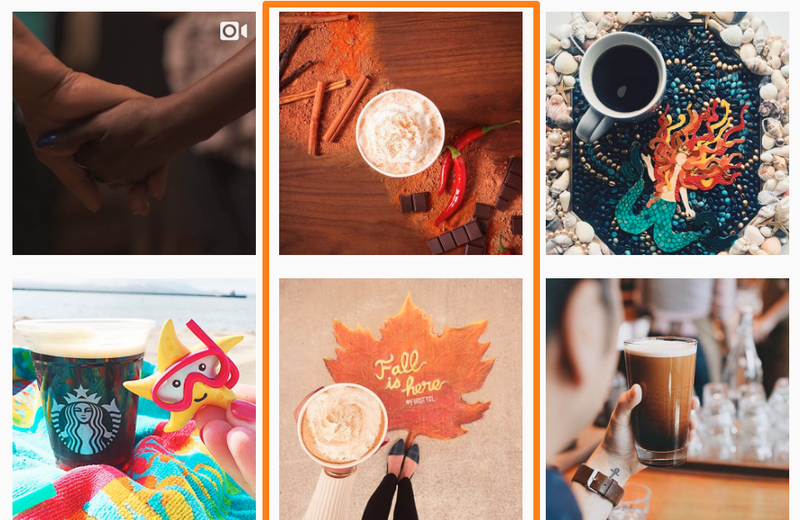 While the contest tactic can work spectacularly well on Instagram, you can also take this time to build up your brand. Remember that Instagram is a visual medium. Start by signaling the change of seasons through subtle branding tactics, such as a logo in the holiday theme or posts in the colors of the season. 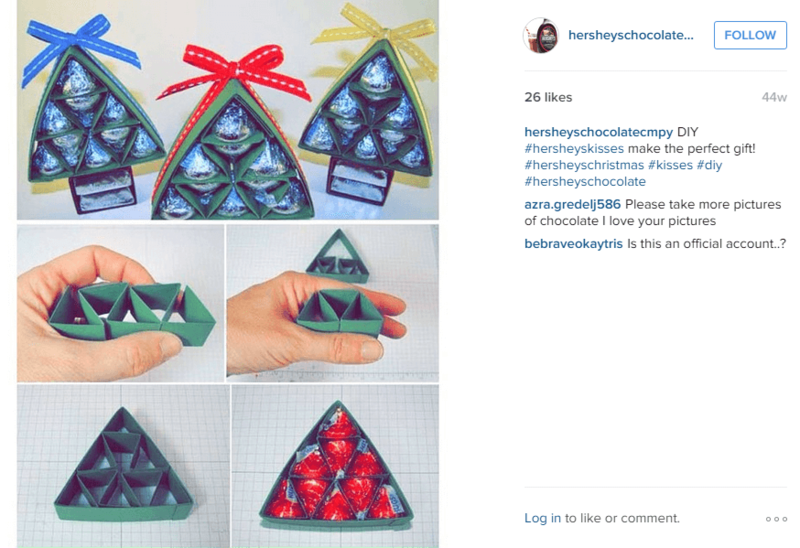 Another Instagram tactic for the holidays is to create season-focused promos. You can also curate user-generated content. 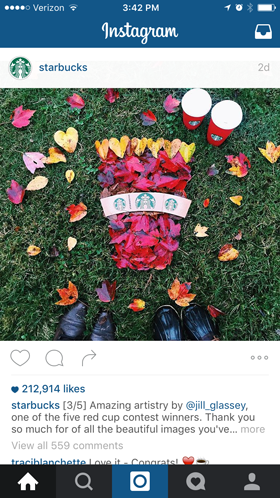 Starbucks, for instance, ran a Red Cup Contest and shared the best images on its Instagram page for fall. Think of creative ways you can use your own products in different Christmas settings. Use holiday-themed colors, such as green, red, etc. Offer a substantial gift to encourage participation. Use your participants pictures on your product pages after taking permission. Such UGC can increase conversions. Despite the rapid growth of social, email marketing remains one of the best channels for customer acquisition during the holidays. In fact, one study found that email accounted for the highest percentage of customers on Black Friday in 2014 – 27.3%. So how can you send better emails this holiday season? Holiday-themed email marketing peaks before Christmas. The promotions, however, start much earlier. It’s also a good idea to tell your readers your email schedule. This keeps surprises to a minimum and helps readers plan their purchases. Free shipping: The email starts off by highlighting the free shipping and 365 day returns policy. Free shipping is a major concern among holiday shoppers. Telling customers outright that they don’t have to pay for shipping can improve conversion rates and increase average order value. Headline: This simple, clear headline tells readers immediately what the email is about. More importantly, seasons greetings is perfectly neutral — important when your customers might adhere to different beliefs. Email schedule: Zappos lays out its email schedule very clearly. 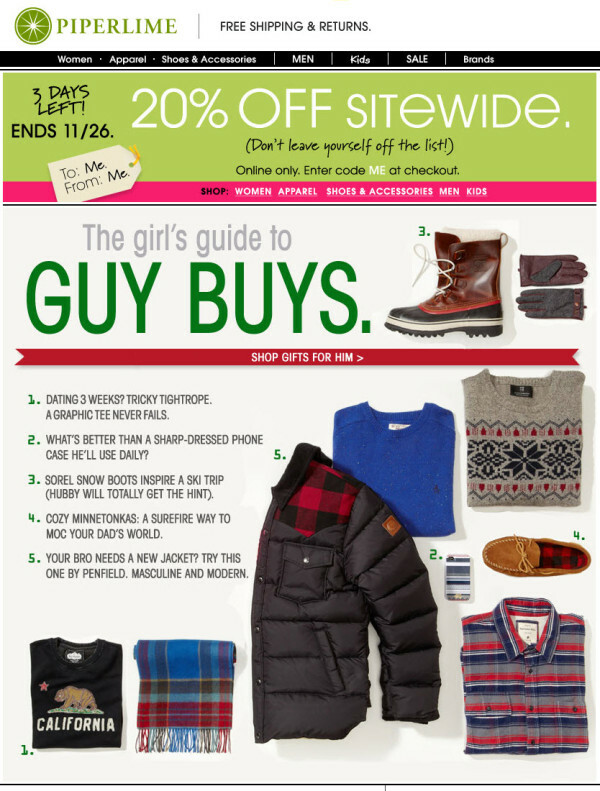 Customers can expect emails thrice a week with gift guides and coupons. CTA: The call to action is clear and action-focused. Start and Now are both action-oriented words, while the CTA button color stands out against the blue background. Zappos family values: Zappos has built a business on the belief that customers are like family. 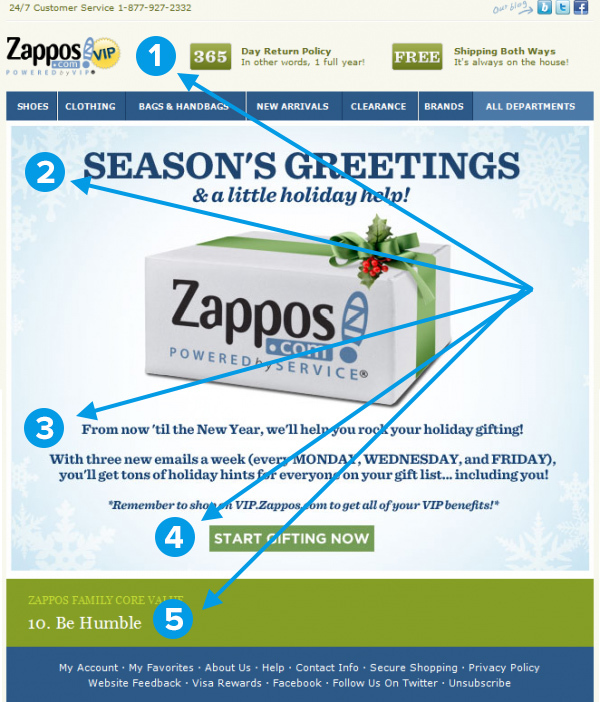 While this footer might not actively promote an offer, highlighting a core Zappos value reinforces the Zappos brand image. Powerful stuff. This is a great template to base your holiday emails on. It’s visual, succinct and hits at all the major customer pain points (free shipping, too many emails, etc.). It also tells the reader what they can expect from each mail. Besides this, you should also send out promotional emails throughout the holiday season. If you can stick to a schedule, then all the better. If you’re running a contest — on Pinterest, Instagram or elsewhere — email will be one of your best channels for audience participation. Sending a strong contest announcement email can make the difference between a successful and a failed contest. Here’s what you should follow in every contest email. Contextually relevant image: A smiling person holding a gift card is a great way to capture attention. Keep in mind that studies show faces attract the gaze immediately on any page. The person in the image is also pointing to the right towards the form, putting it in focus. Countdown timer encourages action: By using a countdown timer for the contest end, you encourage more people to take action. Social sharing buttons: By including social sharing buttons from all popular networks, you get more shares and participants. Bold headline (and fun contest): From the color to the copy, the headline grabs attention. 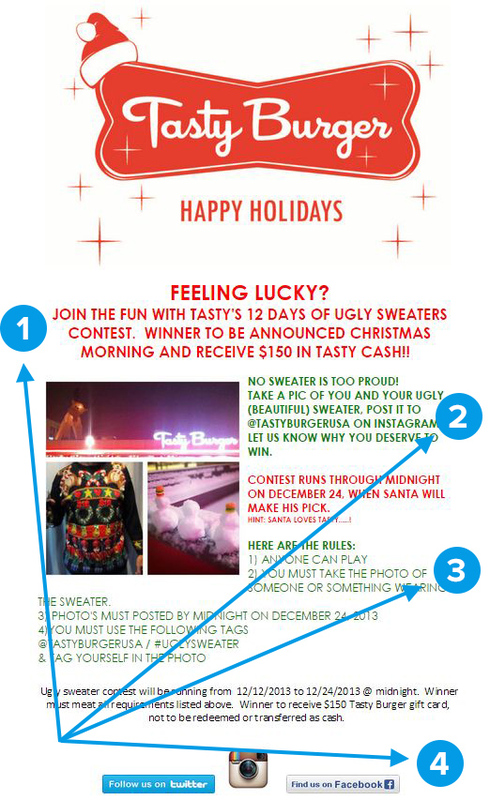 It also helps that the contest itself evokes the festive spirit in a fun way — 12 days of ugly Christmas sweaters. Clear instructions: Your readers should know exactly how to participate in the contest, the contest deadline, and contest requirements. Make sure this information is easy to find in your email. Contest rules: Contest rules can be tricky. You obviously can’t have a lengthy ToS in your email. Instead, lay out your most important rules and mention them as clearly as possible in the footer of your email. Social sharing buttons: Lastly, give readers a way to connect with you on social media or share the contest with their friends. In case of a social contest (such as a Pinterest contest), this can also act as the CTA. Keep in mind that these rules are equally applicable to any email, not just contest emails. A strong CTA, clear instructions and a bold headline (or subject line) will always get you better open rates and engagement. Emails are great but when all your competitors are already doing it, they don’t really help you stand out. Instead of email, experiment with physical postcards or letters this holiday season. These don’t have to be promotional in nature. A simple thank you card can go a long way towards building brand loyalty. Plus, saying thanks to your best customers is the perfect way to spread the holiday spirit. 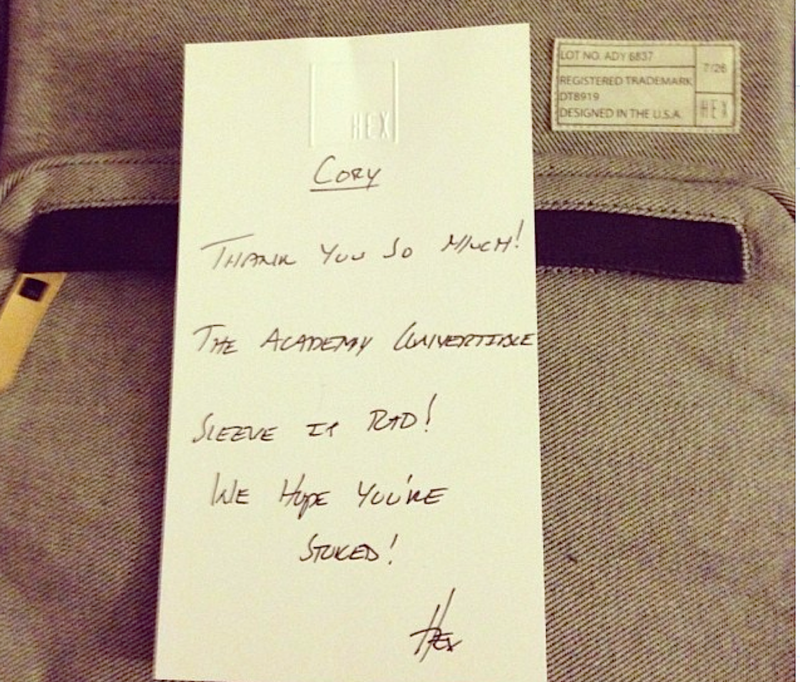 For example, HEX regularly sends out handwritten notes with its orders. If you can send out thank you cards and holiday greetings by hand, great. If not, you can use Direct Mail Manager with Batchbook integration (an Ecwid app) to send out cards automatically. Batchbook will take all your Ecwid customer contacts and work with Direct Mail Manager to send cards for just $1.39/card with a custom message. Another alternative is to use Lob.com to send out postcards automatically. This is slightly technical (you have to work with an API) but you get cheaper postcards at just $0.70/card. Gifting is a time-honored holiday tradition. According to the NRF, gifts also account for a majority of all holiday spending. Of the average $805.65 each person spent on holiday shopping in 2015, $462.95 was spent on gifts for family members. However, if you have a large product selection, your biggest challenge isn’t to get people to buy your products; it is to help people decide what to buy. This is why gift guides are such a big hit around the holidays. How can you create better holiday gift guides? Your customers have different tastes and budgets. Some want cheaper gifts, some want gifts for women, and some want cool things to buy for close friends. Keeping this in mind, you should organize gift guides into the following categories. By Relation: This is a very natural way to organize your products. After all, most of your customers will buy gifts for friends, siblings, parents, etc. By Interests: The best gifts usually take into account the person’s interests and hobbies. 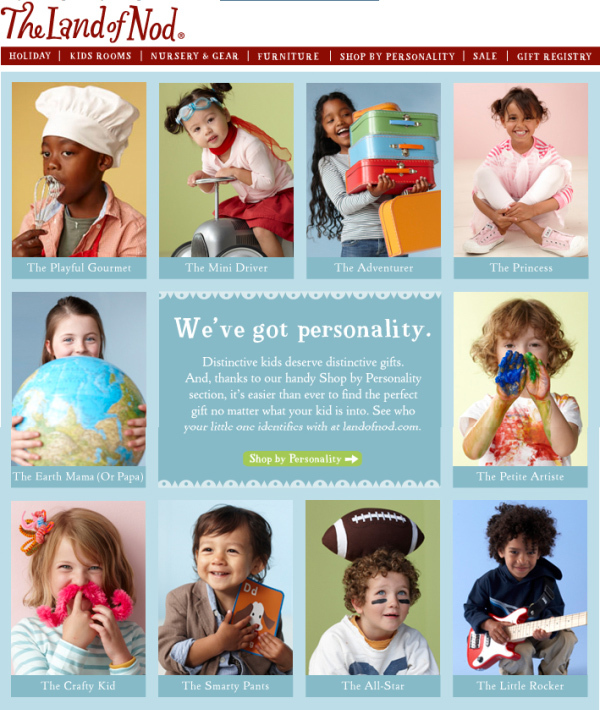 Organizing by interests is a great way to make compelling gift guides. Of course, what interest categories you use in your gift guide will depend on your product. You might have gifts for musicians, movie buffs, fitness enthusiasts, etc. 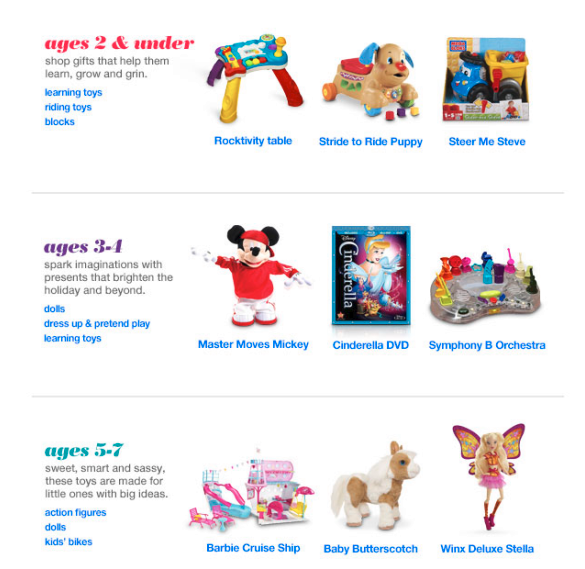 Besides these, you can also organize gifts by holiday (“Gifts for Halloween”, Gifts for Thanksgiving), by item category (“Gifts in Books”, Gifts in Toys), and even by color (“Gifts in Red”, Gifts in Blue), etc. Besides your own site, you should also create separate boards for your gift guides on Pinterest. Amazon does this exceptionally well. Right around the holidays, it starts curating its products into different Pinterest boards. Shoppers spent $31B on gift cards in 2014 as per a National Retail Federation survey. The survey also found that gift cards were the most requested gift item with 62% of shoppers saying they’d like to receive one. Bottomline: your customers love buying gift cards, so make them as easy to buy as possible. One way to do this is to create a separate page for gift cards on your site and feature it prominently in the navigation menu or footer menu. Amazon does it even better. It features a separate link for Gift Cards & Registry in its navigation menu. It also gives shoppers multiple ways to buy and gift cards. You can use gift cards in your Ecwid store by creating single use discount coupons with absolute or percentage off discounts. Follow the answer here to learn more. Lastly, make sure that your gift guides are easy to find. 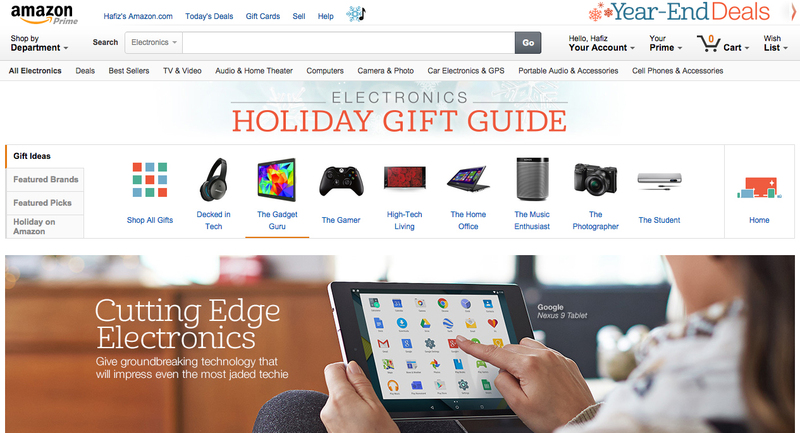 Before the holiday season starts, make sure that you feature your gift guides prominently on your homepage. 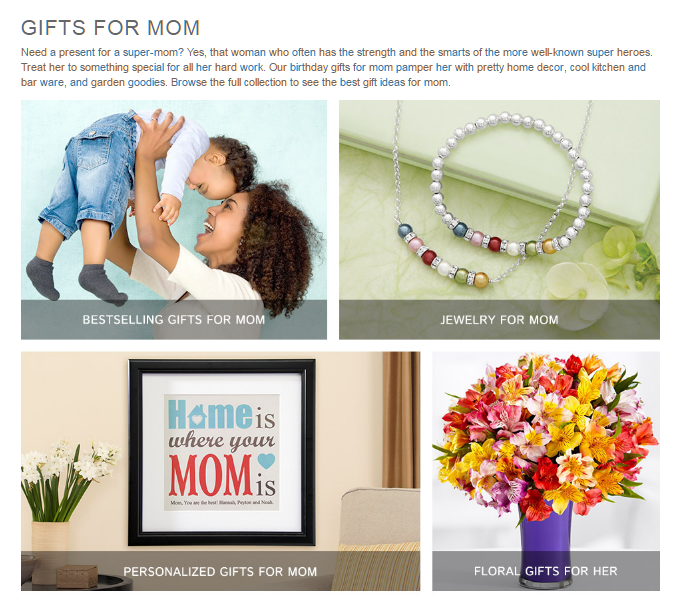 Lastly, make sure to link to your social media gift guides (particularly on Pinterest) prominently on your site. As an e-commerce store owner, the last thing you want is an endless list of marketing ideas. This is why we’ve limited this post to just 4 actionable marketing tactics that yield results consistently. While Instagram will improve your branding, Pinterest will get you more traffic and stronger email marketing will improve your conversions. Meanwhile, a focus on gift guides and gift cards will make it easy for customers to find what they want. Create a number of marketing emails for the entire holiday season. Make sure to create multiple subject lines for A/B testing. Finally, publish your gift guides, Pinterest boards, social media contests and send out your emails well before the holidays.